Given the nature of many thrill rides, it’s not uncommon for them to be compared to aviation. Ever since the Wright Brothers first flew in 1903 (and maybe even earlier), the amusement industry has drawn upon the experience of flying for inspiration. The connection is still apparent today as Lagoon adds the new ride Air Race to its list of rides based on air travel. 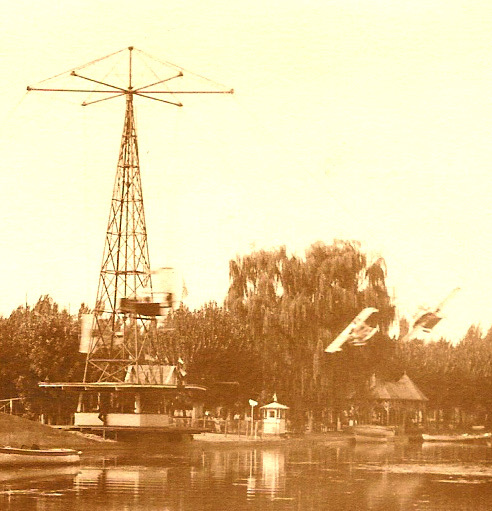 The first such ride at Lagoon would have probably been the Captive Aeroplanes added around the late 1910s. The planes swung out over Lagoon Lake before they were switched out with large silver rocket-shaped gondolas. Real airplanes also entertained Lagoon’s guests. In 1914, a big race was held on the old race track north of the park between Lincoln Beachey in an airplane and Barney Oldfield in an automobile. Captive Aeroplanes over Lagoon Lake. Kids also had the chance to experience floating through the air on rides like the old Kiddie Planes or today’s Red Baron and Helicopter rides. 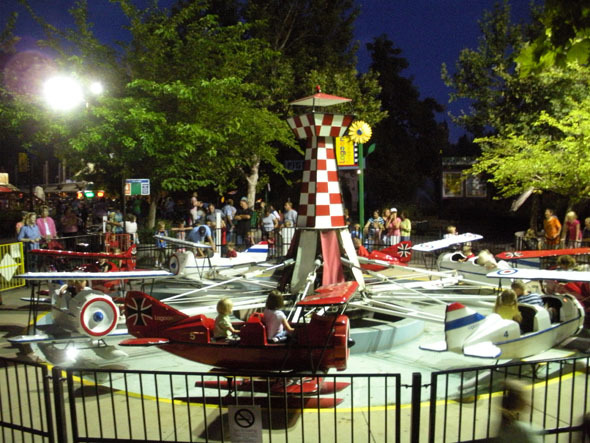 Rides such as Rock-O-Plane, Roll-O-Plane and Octopus were manufactured by Eyerly Aircraft, whose founder Lee Eyerly started out inventing devices to train pilots and later found his creations to be more popular as amusement park rides. When Lagoon added Space Scrambler in 1961, airline stewardesses and a pilot were photographed taking one of the first rides by the Deseret News. 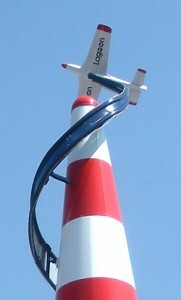 The Sky Coaster’s creator based the ride on the thrill of jumping out of a plane and Lagoon’s Sky Coaster features signage portraying a fictional “Lagoon Air Corps”. For the 2012 season, Air Race has taken its place next to Jet Star 2 and one of Lagoon’s most popular classic rides – Flying Aces. In addition to these rides, many Lagoon rides and their names have also been inspired by space travel such as The Rocket, Satellite and UFO to name a few.